These notes were inspired by the exhibition Road to Justice at the MAXXI museum in Rome (22.06.2018 – 14.10.2018) and the works of the artists that were exhibited: Michael Tsegaye, Wangechi Muti, Johm Akomfrah, Marlene Dumas, Kendell Geers, Bouchra Khalili, Moshekwa Langa, Sue Williamson and Malik Nejmi. Thinking in the vicinity of these works drew me into considering the critical path between an image of Africa and African images, between our European constructions and the cultural and historical practices occurring in contemporary Africa. To explore this space and its subsequent friction clearly means to abandon the lazy habit of considering Africa solely as an object framed by our gaze and definitions. It means to consider Africa as a place peopled by historical subjects whose activities daily dismantle the idea of Africa as the underside and unsaid of modernity. This prospect is not merely proposed in order to correct the picture and insist on another way of telling the tale of modernity. It means more than this. As the African American writer James Baldwin pointed out many decades ago, people who live beneath and below the power bloc, those constituting the subaltern worlds of the marginalised, the negated and the forgotten in the multiple souths of the planet, know far more of the hegemonic world than that world knows about them. In the asymmetrical relations of power that structure the histories of the present there lies not only the registration of brutal powers and accompanying violence but also the potential of a critical cut and epistemological interruption. Like the black figures found in a north European rural landscape in John Akomfrah’s reworking of Albrecht Dürer’s study of a black male and female figure at the beginning of the sixteenth century in his video work Peripeteia (2012), matter out of place pushes a historical episteme and its arrangement of knowing the world out of joint. Not only to comprehend that the world is wider and far more than us, but to begin to listen and to learn from what exceeds and refutes our authorisation means to crease the existing map and perforate it with other trajectories. This immediately implies abandoning the binary distinction between here and there, between Europe and Africa, in order to recognise the deep and reciprocal entanglements that produced both in a world worlded by planetary modernity over the last five hundred years. This also means to confront the colonial formation of the present and the violent subordination of the rest of the world through discoveries and conquests that were justified by a racialising hierarchy based on the presumed moral superiority of the West over the rest. Insisting that Africa is an integral part of modernity from its very beginnings is to touch the centrality of racialised slavery in the making of the modern political economy of the Atlantic. It is also to follow the deep inscription of that history in the formation of Western democratic institutions and their visions of ‘freedom’ (Fanon, 1986; Baldwin, 1972; Sharpe, 2016). This centrality, no matter how often it is refused and negated, historically insists and persists in the diaspora of black music and its becoming the soundtrack of the modern metropolis. Precisely in this key, I think that the visual arts, just as with music and literature, configured within the long history of modern Africa propose a critical space where it becomes possible, I would say imperative, to consider other temporalities and rhythms within a modernity never simply authorised by Europe and the West. Opposed to the sequential logic that considers ‘progress’ as the linear extension of Europe towards the rest of the planet, here a worldly and creolised formation proposes a series of interruption and interrogations that interrupt all ideas of a linear and homogeneous temporality. Just to consider the multiplicity of Africa in its urban realities – from Cairo to Cape Town, from Kinshasa to Casablanca – shatters the frame of unique modernity that is ours to define and manage. Neither, when considering social processes and cultural practices in Nairobi or Luanda, is it a mere mirroring or poor imitation of the West. What we encounter is the perpetual translation and transformation of a modernity that has always been planetary in its economic, political and cultural formation. Language migrates in multiple directions. The poetics of the arts not only illustrate this perpetual movement, but also the historical and critical centrality of a migratory modernity. Or, and to insist, this means to think and reconsider modernity itself in terms of migration, and not merely of financial capital and goods, but also of people, histories, cultures, and their possibilities. This evokes the complex, messy, always unfinished, business of cultural and historical processes, rather than the rationalising chain of our conceptual categories. In this landscape the realities that emerge from metropolitan Africa art propose a heterotopia; that is, a diverse configuration of the spacetime of modernity that interrupts and interrogates our version, As the ‘southern question’ critically intersects with the world to interrogate the historical making of modern subalternities, we encounter places and practices proposing other ways of conceiving and constructing the contemporary. Cities are sites of complex encounters, of the mixing up and mixing down in creolised cultural mutations (invariably accelerated by those once colonised migrating to the metropole). This point was already made in the Fourteenth century by the great arab historian Ibn Khaldun. Today, more than ever, local traditions become sites of translation that connect the diversity of postcolonial cities – both London and Lagos, Nairobi and New York – in a series of shared networks that simultaneously sustain local differences and diversities. Here the visual arts, music, poetry and writing, continually reconfigure another sense of urban space, disseminating a planetary coexistence that queries the asymmetrical relations of power that define the present. Proposing languages in movement, a migratory poetics, is also to prose a diverse politics. Such languages – in the specificities of their grammar and aesthetics turn – themselves become critical languages. The challenge at this point is that of taking lessons from elsewhere, of learning from Africa, from its cities and from their artistic practices that circulate in a world that is not only ours. As Adorno once put it, this means to begin an apprenticeship in being at home when we can now no longer be sure to be at home. Resisting the established maps, even insisting with Édouard Glissant on the right to opacity and refusing to render oneself transparent to Western eyes, a negated and repressed colonial past and its constitutive role in modernity – in this case Africa – becomes an unsuspected archive within our culture and its formation. Not yet recognised it is destined to arrive from the future in an as yet uncharted Afrofuturism. At this point contemporary African art flees from the reserve of white hunters and merchants through promoting and promising a modernity still to be registered, configured, imagined and invented. On the street at night: it is warm but not too humid. Nairobi is over 1600 metres above sea level. We are strolling on Electric Avenue in the Westlands district. This is the heart of Nairobi clubland. The volume is incredible. Even walking in the open it is impossible to converse. This is musical warfare. Between cars and pedestrians, sounds battle each other seeking their auditory claim on the territory. We stop to take a beer outside on the sidewalk while music bellows out of an open door leading down some steps into a sonorous density so thick as to reverberate through the body, denuded of words or explanation. In the interiors of the body of sound we discover folds in time that permit other times to be heard. Reasoning with sounds as living archives we encounter unsuspected genealogies, other modalities to rhyme, rhythm and reason the world that ruffle and disturb the singularity of the approved narrative. Such sounds promote counter-histories. They disseminate intervals and interruptions in the well-tempered score which the hegemonic account plays to itself’. Is this a different or an emergent public sphere? It is certainly the active formation of a critical discursive space (Hauser 1999). We could even suggest that a form of citizenship, that is perhaps elsewhere formally denied or truncated, is here publicly sustained in sound. Such transitory geographies of musical belonging connect us to the altogether more complex unfolding of the immediacies of the world. We are drawn into multiple temporalities and spaces that link us to what we can rarely fully comprehend or attest to. This takes us beyond the rational conversation that apparently typified the Eighteenth-century coffee house and the measured prose of the modern press promoting public debate proposed by Jürgen Habermas (Habermas 1992). That particular sense of the public sphere, and associated model of citizenship, is contaminated and remixed down here in sub-Saharan Africa (and certainly not only there). In the diverse urban spaces of Nairobi, Naples, Lagos, Lisbon, Luanda, Kiev, Johannesburg, Berlin, Bristol and Cairo, public space is also lived, moulded and reconfigured in an on-going set of practices that scratch, bend and splinter the presumed model of European provenance, rendering explicit within the folds of the universal abstraction the problematic relationship between citizenship, social space, everyday culture and democracy. Here, European and extra-European scenarios are unsuspectedly conjoined in a ‘general questing for democratic agency in an era of declining electoral participation, compromised sovereignties, and frustrated or disappointed citizenship’ (Eley 2002). Caribbean and Turkish diasporas in Bristol and Berlin, illegal immigrants in the backstreets of Naples, rap in Arabic, all further underline that other versions of public life, citizenship and modernity are at work. Sharp distinctions between public and private life come undone. Just as in Kenya where everything is modern – both the ubiquitous cell phone and the poverty, the midnight car wash in the club complex and the urban slum – a democratic participation lies alongside and often independent of the formal manifestations of public politics. In noisily taking the lid of the institutional can, the contents of modernity that can be observed and heard in a Nairobi night invite us to reconsider our lexicon, uncoil our certainties and take a further walk in the world. After all, the democracy and citizenship that we claim in the West, fully depends – in both its economic structures and cultural tissues – on the subordination and exclusion of the bodies and histories of those who inhabited the colonial world and who now live in the postcolony. Not only has our ‘freedom’ been structurally dependent on the extension of non-freedoms (slavery, indenture, genocide), but the liberal formation of modern, European democracy on both sides of the Atlantic is riddled with the perversities of power and property that makes its citizens the bearers of planetary injustice. The rule of law, that is the universal claims of a property-owning class and its political economy to legislate for the world, not only reveals the arbitrary and unilateral powers of a European derived sovereign will on the planet. It also exposes that very same logic to both translation and treason. Elsewhere within modernity, the terms of the modern polity are not merely a sham to be wielded by dictators and oligarchs while pursuing their own particular interests. Ideas about citizenship, democracy and the public sphere are everywhere taken up and embodied by subjects engaged in the multiple languages of modernity. In particular, in the immediacies of the simultaneously local and trans-national spaces of the city, lives, cultures and prospects are both inhabited and appropriated. Time is technologically coordinated in mobile circuitry, DJ mixes, satellite connections, social networks. Traditions are transmitted, transformed, translated. All of this is part of what David Featherstone calls the ‘geographies of subaltern connection’ (Featherstone, 2008). Let us remain in this space and consider Africa as the site of what Jean and John Comoroff have called ‘Afromodernity’ (Comoroff and Comoroff, 2012). It is here that the colonial past emerges in our midst as an uninvited guest, casting a persistent shadow over the archive. The history of the modern south, constructed in the political economy of a planetary modernity to be colonised by the predatory capitalist concerns of Euro-America, now becomes an unsuspected element in the equation. Rather than a residual or underdeveloped place to where the material refuse and racist refusal of the modern world is directed, it becomes a critical site of interrogation in the very midst of a modernity that consistently considers it to be marginal. So, this is not an archive simply to be mined and exploited, but rather one that is still to be registered; that is, to be acknowledged as a central component in the modernity that tends to exclude its presence in the narrative. If Africa is still presented as trying to ‘catch up’ with the modern Occidental world, the arts of Africa, their travels and transformations, narrate another history. This is a history, relayed in contemporary sound and images, that draws us into mapping a very different set of itineraries crossing the formation of modernity. The point here is not only to disturb accredited historiographical tools of explanation and propose another modality of archiving and research proposed by the audio and visual arts. It is also to suggest a critical configuration that evidences the historical presence of Africa in European modernity as much as the usual tale of a colonial Europe in Africa. This is less about collating the historical evidence of Black Athena or pointing to the deep history of mankind’s long march out of the Grand Rift Valley towards the rest of the world. Rather, and more urgently, it is to insist that modernity has always depended on planetary coordinates and coordination. Here, re-drawing inherited geographies and historical pathologies, Africa emerges as a central element in its formation. This is to contest the externalisation and marginalisation of the non-European world in the making of modernity that Jacques Derrida once designated a ‘white myth’. These considerations can clearly be extended to contemporary African art. Here works exist along multiple scales that not only and most obviously confute such binary distinctions as the local and the global, but also prove impossible to be slotted into the categories prepared for their reception: African and authentic. African artistic practices subtract themselves from subordination to the categories of anthropology and sociology where they are expected to confirm Occidental perspectives. Today, this desire is consistently dissimulated. An artist such as Yinka Shonibare MBE, who ironically insists on his paradoxical historical membership of the British Empire in his very name, deliberately reworks the past of Europe in Africa while conjoining it to the present of Africa in Europe. Recovering, replaying and redressing the past in this manner evades simple accommodation or fixed locations. The historical and cultural fluxes proposed by such work crosses the art world with histories of complex belonging. These speak of multiple belongings. The heterogeneous assemblage of materials and icons in Shonibare MBE’s works – Dutch colonial wax prints, West African couture, British naval heroes, the Ancien Regime and Victoriana – queries the cultural construction of a consensual aesthetics when the materials of empire are reworked into another narrative. Against the predictable lineage of Occidental art history an altogether more complex and undisciplined archive overflows the frame, proposing a supplement that cannot be readily accommodated or incorporated. Such art proposes less an object to be analysed and explained according to the logics and languages of artistic and disciplinary canons and more a critical dispositif or apparatus with which to think, live, cross and interrogate a discursive regime that thinks it is able to explain and render art an object to catalogue and explain. In this scene, the past with its memories and archives proposes a diverse genealogy and a different modality for receiving its presence in the present. There is no pure or isolated object, nor a definitive explanation of the past, to be discovered. Rather, there are historical and cultural processes to be acknowledged. What counts is not the object that is unearthed but rather the processes that constitute both it and the manner of its unearthing. This marks the critical passage, of Foucauldian memory, from registering the stratification of archaeology to arriving at the critical constellation of a productive genealogy (Revel, 2012). This to propose breaks and discontinuities; that is, a working of the past into new critical configurations. This also suggests that rather than simply tracking Africa in Europe, it becomes urgent to think with Africa. Here Africa is retrieved from being a mute object of analysis as it becomes an emergent critical space, an ongoing interrogation and interruption. This is rather beautifully captured in Abderrahmane Sissiko’s cinematic enactment of the hypothetical trial of the IMF for holding modern Africa hostage to debt in Bamako (2006). With this we step beyond the colonial division of the world that has only considered Europe in Africa, and never of the constitutive role of Africa in Europe. Moving beyond such binaries is to suggest a critical space in which the existing cartographies of power are dis-assembled and re-mixed in an economy of signs and sounds that challenge the conceptual confines of Occidental art history and its critical language. This deviation is not set in train simply in order to recognise alternative and subaltern realties. Initially, this may be important and necessary, but it is a point of departure, not of arrival. To travel further into the question is to register the worlds that have persisted and resisted within modernity from its inception as part and parcel of its global web. Unrecognised and negated, Africa in Europe, like the black slave in the history of capitalism, or colonial troops deployed in Europe’s imperial wars, is a constant shadow interrogating the modernity that consigns them to its margins. These are realities whose presence have not simply been repressed and are now being belatedly recognised. Rather, their historical and cultural centrality to the making of a modernity we consider ‘ours’ forces us rework the archive that once authorised us; that is, to break it open and spill its contents into further critical contours and another manner of narrating the world. At this point the limits and location of the European narrative is sustained, as Olu Oguibe puts it, in the ‘divergent historical trajectories that constitute a colonial or postcolonial modernity’ (Oguibe, 2005, 419). Here it becomes imperative to ‘read within the frames of a larger historical moment’ (Oguibe, 2005, 420). This means to measure and evaluate the terms of participation in modern art and modernity, rather than being simply incorporated or co-opted as an external and exotic ‘other’. It further means to inaugurate breaking the spell of Occidental legitimation for, as Rasheed Araeen puts it the ‘structure of colonialism cannot be dealt with only by those who are colonised’ (Araeen, 2005). So we arrive at the necessary unwinding of the history of art as a liberal, humanist Occidental discourse that has historically and culturally contributed to the elaboration of the colonial apparatuses that also legitimated its voice and authority. The absence of contemporary African art in Occidental institutions is therefore not simply the symptom of a colonial pathology that continues to think of Africa as ‘down there and back there’, and desires only the anthropological authenticity of local African arts and crafts. For what it poses is a hole in the epistemological fabric that clothes the West. It is a hole that cannot simply be patched up with threads drawn from existing disciplinary protocols. This would only be a further colonial move. The idea that an artist or curator working in Lagos or Luanda moves and is sustained in the material and immaterial circuits that constitute the international art world is still rarely considered. Of course, he or she operates within unequal relations of cultural power and recognition: Lagos is not Los Angeles, Luanda is not London. Still, connections and a potential resonance are undeniably in play. There simply does not exist a shadowy exterior cast by the light of Occidental progress. The sounds and images of James Brown in Mali in the 1960s, and their unsuspected conversations with local youth styles and photography, is far less about obvious US cultural imperialism in the so-called underdeveloped world and altogether much more about multiple connections to black diasporic aesthetics both after European colonialism and beyond local post-independent nationalism (Diawara 2001). If Africa has always been part of the historical constitution of modernity, it has also consistently been inside the cultural and aesthetic networks of its modernism. Alongside the noted art history narrative of Cubism and Surrealism sampling the continent we finally begin to touch the deeper economy of the circulation and translation of ideas, perspectives and practices that never move in a single direction nor respect rigid centre-periphery distinctions. 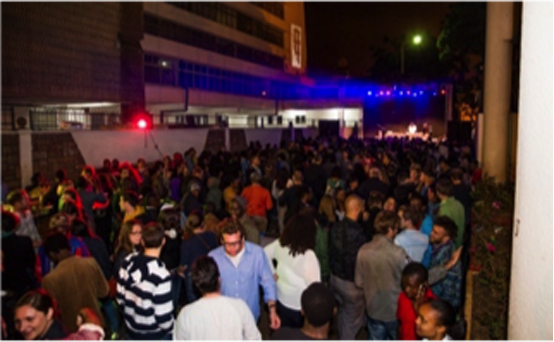 The ten African and European cities evoked here refer to a project called Ten Cities, promoted by the Goethe Institute in Nairobi. The project examined the construction and extension of public space through music, DJ practices, dance and critical discussion. Details available here: http://blog.goethe.de/ten-cities. It can also be consulted in series of essays published in Hossfeld 2019. Araeen R., Modernity, Modernism, and Africa’s Place in the History of Art of our Age, in «Third Text», 19, n.4, 2005. Baldwin J., No Name in the Street, Viking, New York 1972. Comoroff J., Comoroff J., Theory from the South. Or, How Euro-America Is Evolving Towards Africa, Paradigm, Boulder 2012. Eley G., Politics, Culture and the Public Sphere, in «Positions», 10, n.1, 2002. Fanon F., Black Skin, White Masks, Pluto Press, London 1986. Featherstone D., Resistance, Space and Political Identities: The Making of Counter-Global Networks, Wiley-Blackwell, Oxford 2008. Habermas J., The Structural Transformation of the Public Sphere: Inquiry into a Category of Bourgeois Society, Polity Press, Oxford 1992. Hauser G., Vernacular Voices: The Rhetorics of Publics and Public Spheres, University of South Carolina Press, Columbia 1999. Hossfeld J., (ed), Ten Cities, Spector Books, Leipzig, 2019. Oguibe O., The True Location of Ernest Mancoba’s Modernism, in «Third Text», 19, n.4, 2005. Revel J., Foucault, une pensée du discontinue, Fayard, Paris 2010. Sharpe, C., In the Wake: On Blackness and Being, Duke University Press, Durham 2016.